Winter wheat can normally withstand cold temperatures well as long as soil temperatures at the depth of the crown are not in the single digits for a prolonged period of time (see article in eUpdate 434, December 13, 2013). Winter wheat typically has its highest level of winterhardiness in December and January. Leaves on wheat exposed to very cold temperatures may turn brown and die back somewhat, but that doesn’t necessarily mean the entire plant is dead. Soil temperature is a more important consideration than air temperature alone during the winter. In most cases so far, soil temperatures have not been cold enough to create concern for the wheat. 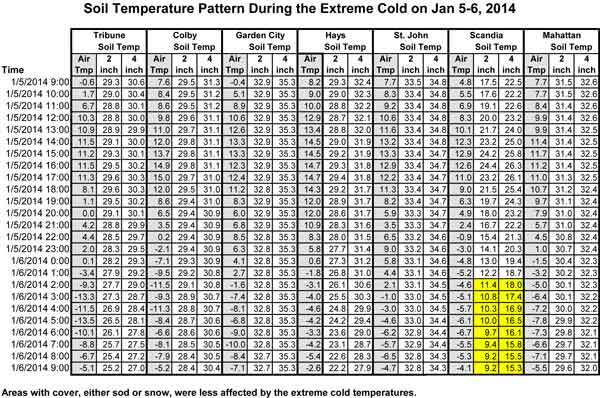 However, the chart below from Mary Knapp, K-State Weather Data Library, shows there are a few areas of concern, especially where soils are dry or there was no snow cover during periods of extreme cold. For example, soil temperatures at the 2-inch depth reached 9 degrees at Scandia, in Republic County. Will this cause some winterkill in those areas? It’s too soon to know, but the situation should be monitored – especially on terrace tops and north-facing slopes. I wouldn’t be surprised if there is some damage to the wheat in parts of north central Kansas where soil temperatures were this low. Later this winter, producers could dig up some plants and bring them inside. After a week or so of warm conditions and water, wheat should begin greening up if it is alive. Otherwise, producers can wait until spring greenup begins in the field. Areas of dead or dying wheat should be noticeable at that time. Be aware, however, that damaged wheat may begin to green up then die back later.